The Pope just left Washington. We live a few blocks away from the Vatican Embassy, and yes for a few short days, Pope Francis was our neighbor, a resident of the ‘hood. This is clearly no ordinary Pope. In Popes past, I had always thought of the Church as being an anachronistic entity steeped in the traditions and rules of another era, far removed from the contemporary present. But Pope Francis is another story. He blazed through Washington like a man on a mission, determined to heal, if that is possible, the turmoil of Washington that has reached circus-like dimensions with Donald Trump and the Presidential campaign. And with the hopelessly regressive arguments swirling around the Nation’s Capital on topics such as immigration, climate change, and conflict in the Middle East, the Pope emerges as a voice of reason, a bright light on the horizon, a rare glimpse of wisdom: not just in the religious sense, but as a humanist. 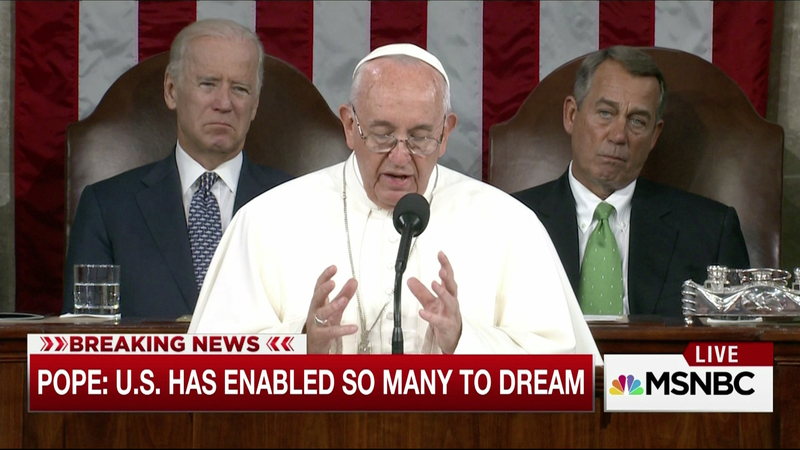 Pope Francis is above all a great human being, and perhaps the greatest living statesman of our time. This is an open source Pope, one who believes in the generous and giving philosophy of doing for the common good. Everything he says seems to revolve around this idea of serving common needs, raising people up from the bottom, creating wealth not for individual benefit, but for those who really need it. With Pope Francis, society is a collaborative project based on helping others, solving issues through collective effort. It all might sound unrealistically utopic, but when the Pope speaks about real problems, conflict, and misery in the world, he injects a sense of hope, and he does this through the credo of open source philosophy, the social motivation of lifting others. It’s quite convincing, especially here in America, where a broken government mired in divisiveness exacerbates the country’s tendency for cruel blaming, lack of sensitivity, hateful arrogance, rampant bigotry, and a thirst for war. But the Pope doesn’t just talk about humility, he lives it. While he was staying down the street on Massachusetts Avenue, out front was parked his little black compact Fiat 500 sedan. Whereas his staff was riding in the usual black, hulking Chevy Surburban SUV’s, Pope Francis rode in the back seat of an economy car, one you probably wouldn’t choose from a car rental agency. There was no state dinner, no fancy banquets, rather, today he ate with the homeless in a down and out section of Northeast Washington. Perhaps what most caught my attention, was how his embrace for the common good illuminated his concern for the environment, which he refers to as our “common home.” What a brilliant way of framing this hot topic in an inclusive way. We save the environment because it is the one thing that we all share: the common ground we stand on, the air we all breathe, the water we drink. And lastly, how technology, rather than being a force of destruction or a source of fetishism, could be redirected to help solve problems for the common good, to improve social relations: technology as a tool for lifting humanity. I say with that lofty idea, media artists take note: we have the means to make the world a better place by finding ways to distribute our work for the common good… as in, open source.